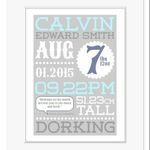 These delightful prints are full of detail, and also include a space for a personal message too. 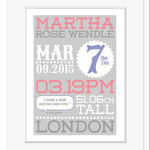 In a fresh, contemporary design they are a lovely memento to mark the important moment when a new baby in born. Please note: There is a space available on the print for you to put a personal message. Please keep within the maximum number of words allowed (14 words), and double check your spelling before submitting. Below the message the sender's name[s] will also be included - for example, 'Mummy and Daddy' or 'Granny and Grandad' up to a maximum of 5 words. (Tip: if you can't fit in everyone's individual names due to the space limitations, you could perhaps adjust the wording to something like 'The Smith Family', etc). Example wording: "Our gorgeous, perfect and precious daughter - we love you so much"
Example sender names: "Mummy and Daddy"
About your Print: Your artwork will be created to order and printed onto very high quality gloss finish paper stock. It will be posted with a backing board and smooth white finish bevel cut mount, and sealed in a protective crystal clear presentation sleeve. Your print will be posted in a strong hard backed envelope and will require a signature on delivery. The overall size of the mount is 10"x8" and will fit into any standard 10"x8" picture frame. Ready to order? Please complete the following form, and when you click 'submit' you will then be directed through to the 'buy now' button and you can complete your purchase.